We can take inspiration for new restorative poses from “active” poses and create classes for ourselves and our students that are as playfully varied as vinyasa practices. Inventing and inhabiting new restorative poses refreshes our attentiveness and hints at the abundance of situations, in yoga and in life, in which relaxation is possible. 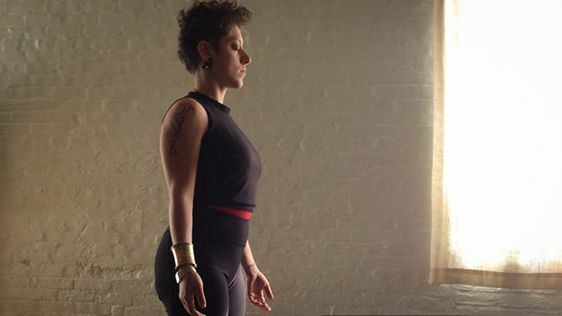 “A restorative pose is any pose in which the arrangement of your bones, the support of props, and the gentle pressure of gravity work together to rechannel the breath,” says Jonina Turzi. In the following gentle yoga sequence of passive poses based on “active” poses, at least two restorative poses will use the same prop arrangement, making the transitions between poses fluid, like those of a vinyasa practice. However, the poses may be done in any order that feels good to you. You can also add one or two of these restorative poses to the end of a more active practice, or use any you like as a wind-down before bed. Hold each for as long as you like. 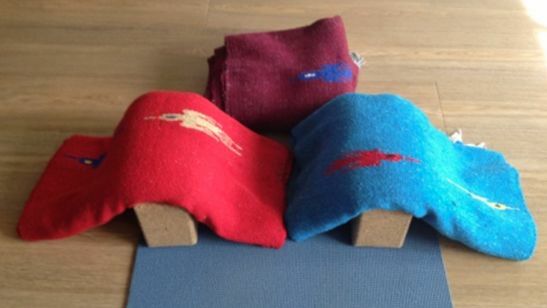 For poses one to three, start with: two blocks set on their middle settings, covered with blankets, if possible, and one blanket folded into a square at the top of the mat. Supported locust, a downward-facing pose, serves to turn one’s attention away from the world, setting the stage for relaxation, while blocks help to move the shoulders into place. At one end of your mat, set up two blocks at their middle height, shoulder distance apart, and drape them with blankets, if available. Fold a blanket into a small square to support your forehead. You might also want to place a partially rolled-up blanket horizontally across the middle of your mat, where it will support the tops of your thighs. 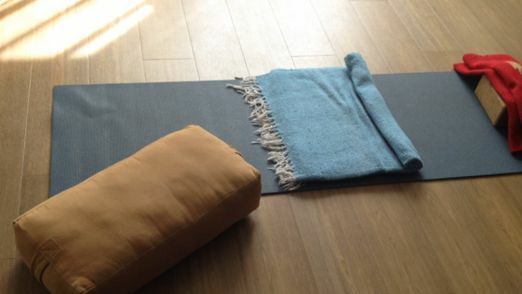 If you have more props to spare, you might, as in the second photo, place eye pillows in your upward-facing palms, and a bolster at the back of the mat, where it will support the tops of your feet and the fronts of your ankles. Allow your chest to sink down as the pressure of the blocks moves the heads of your shoulders back toward the ceiling. Keep the blocks and the blanket square and arranged as they were for the previous pose. Remove the blanket roll from the middle of the mat. 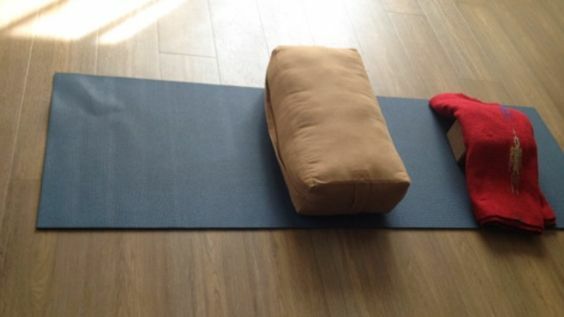 Move the bolster to the front of the mat, tilting it against the blocks. Lie on your back, knees bent over the bolster, feet on the blanket square. Arms may be placed wherever is comfortable for you. From supine supported chair, cross your right leg comfortably over your left leg. You can place a rolled-up blanket (or another bolster) lengthwise along your torso, and give it a loose hug. Hug yourself if you don’t have more blankets or bolsters. After enjoying a few breaths here, switch sides. For poses four to five, start with: a bolster placed across the middle of the mat, and one blanket-covered block where your head will be. You might stay here, in a supported fetal position, or, for a gentle hip stretch, step your right foot to the floor just in front of your left thigh, and activate the pose by energetically pressing the right outer ankle and shin into the left leg. (If this stretch is too intense, try moving the left leg and right foot further away from your chest, toward the back of the mat.) Do the following pose before repeating both on the second side. From the previous pose, cross your right leg deeply over your left leg, and interlace your arms, right arm under left. Repeat poses four and five on the second side. For poses six and seven, start with: a block (covered by a blanket, if possible) where your head will soon be, and a partially rolled-up blanket across the middle of the mat. Keep a bolster handy. Lie on your left side in a fetal position, the blanket-covered block under your left ear and the left side of your waist supported by a blanket roll. If you leave a third or so of the blanket unfurled, you can use that unrolled part of the blanket under your right hip for padding. Lengthen your right leg behind you (toward and perhaps beyond the right rear corner of your mat) on a bolster placed diagonally so that it will support the right knee, shin, and foot. You might bend your elbows, resting one hand on top of the other, or place another blanket folded into a plump square between your forearms, reaching forward as much as is comfortable, hands in line with your forehead. (Note: If the bolster is too low for your right leg to easily rest on, make the bolster higher by stacking another bolster or blanket on top of it, or place a spare block or two underneath it.) Move into the following twist from this pose before repeating both on the second side. 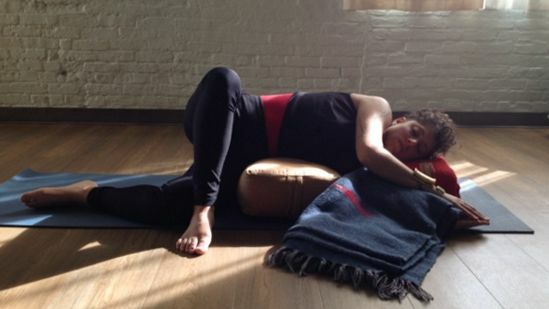 From the pose above, roll onto your back, both legs straight out in front of you, arms at your sides, the blanket roll supporting the lower back. Then, keeping your shoulders grounded and chest facing the ceiling, take a twist, rolling onto your right hip to drape your left leg over the bolster. (Again, feel free to elevate the bolster with another bolster, blocks, or a blanket if your left leg does not easily come to the bolster.) Repeat poses six and seven on the second side. For the next three poses, start with: a bolster-block “ramp” (one block placed at the lowest setting, the other at the medium or highest setting, and then a bolster placed atop the two blocks), peaking at the part of the mat where your head will soon be. Bring your sacrum to the lowest end of a “bolster ramp” running lengthwise down the center of your mat. Lean back, resting your spine and the back of your head on the bolster. Straighten both legs, then bend your right knee to the right, resting the right foot on the left inner thigh. Place a blanket under the right knee if it does not drop open comfortably, and feel free to support the forearms and backs of the hands with blankets. After repeating this pose on the second side, stretch both legs out, and take them as far apart as you like. Pause for a few minutes in this symmetrical pose, supporting the undersides of the knee with rolled-up blankets, if available. Move the bolster ramp slightly to your left, or move yourself slightly to its right, as you come to lie on your belly, placing as much of your left leg up the bolster ramp as you comfortably can. You might again place a partly rolled blanket at the tops of the thighs to both guide the hips back into their sockets and cushion the frontal hip bones. For a gentler backbend, scoot further forward, toward the front of the mat, so that less of the left leg is lifted by the bolster. Support your forehead with a blanket so that you can breathe easily, and place your hands wherever they are comfortable. Repeat on the second side, then take both legs up the bolster for a gentle, symmetrical backbend. Perhaps, from the previous pose, you simply turn over to lie on your back and take both legs up the bolster ramp. Or, if you happen to have another bolster and two blocks handy, build yourself another ramp, this one “peaking” toward the back of the mat. Arrange yourself facing upward inside the cradle of this boat, sitting on the floor with your legs up one bolster and your back and head supported by the other. Place blankets underneath your hands, if you like. Having connected to your relaxation in a number of passive poses based on active poses, can you now retain a sense of passivity in a manifestly active pose? Ease your way up to standing, and endeavor to make tadasana (mountain pose) into your shavasana (corpse pose/final relaxation). Tadasana can be a restorative pose: Here, the shape your body is in, the support of your bones and the floor beneath you, and the force of gravity can work together to allow your breath to expand its field. 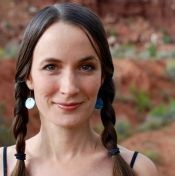 While the word “vinyasa” is often associated with a fluid and active yoga practice, its Sanskrit roots yield the translation “to place in a special way.” (By this definition, all restorative yoga, with its careful prop set-ups, might be seen as “vinyasa.”) For this tadasana, place your feet with as much care as you’ve used to set up your props, arranging them so that your middle toes are facing forward. Unclench your toes even as you deliberately root down with the full surface area of the balls of your feet and your heels and drift the crown of the head upward. Allow each breath to take its special place after the one that came before and to transmit its own movement through your receptive body. No need to stand completely still. Invoke a seaweed-like quality; you are part of an underwater forest, simultaneously rooted and floating, held up by the watery air. Allow yourself to tendril upward toward the light that you sense with all of your cells, playing on the surface of the water far above you. Notice if this pose feels like work anywhere; if so, keep trying to give that work to your feet, pressing them down into the floor, your seabed. As you return to the activity of your day, you might find yourself noticing that here, too, relaxation is possible. Here, too: In the pauses between your movements, or in the movements themselves, it is possible to relax. Like a fabric, all of it, all of life is a kind of hammock that holds you, an emulsion in which you are suspended. 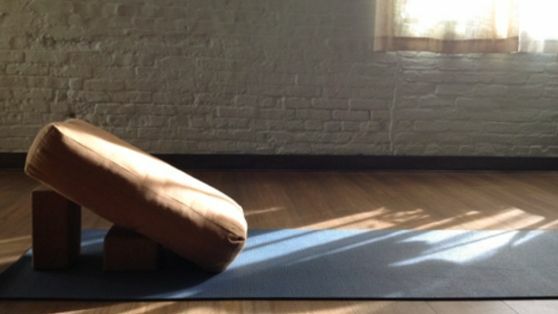 You might further your relaxation just by counting the countless restorative poses you could make out of other yoga poses, out of thin air, out of the plump earth, out of bolsters, pillows, blankets—holding you in places where you are not usually held. Out of the tidal wash of breath. Out of your shoulder blades moving on your back, with the breath, just behind the heart, like wings for the heart. Out of your strong heart. Out of the light that sluices over you, out of the darkness that drapes, out of the touch of the air on your skin, the sounds in the room. Like a fabric, all of it, all of life is a kind of hammock that holds you, an emulsion in which you are suspended. And right now, as you sit, as you breathe, as you read, this too, it seems, is a restorative pose. Here, too, it seems you are held. Here, too, you have everything you need to relax.